On Friday, John McCain will become the 31st person to lie in state in the United States Capitol, joining a short list of American leaders to have their coffins displayed at the Rotunda for public viewing. Dating back to 1852, it’s among the rarest of posthumous tributes for government officials in the United States. As such, the lingo and customs of the ceremony might be unknown to many. That said, “lying in state” is often used colloquially for private citizens, as when a long line of visitors paid respects to Aretha Franklin at the Wright Museum in Detroit this week. She was not technically lying in state in the governmental sense, but most news outlets, including The New York Times, used the phrase. Aside from the 31 people to lie in state, four private citizens have lain in honor at the Capitol: the Rev. Billy Graham, the Christian evangelist, in February; Rosa Parks, the civil rights leader, in 2005; and two Capitol Police officers, Jacob J. Chestnut and John Gibson, who were shot in the Capitol in 1998. Mr. McCain will become the 13th senator to lie in state, including some who later reached the White House. The last senator to lie in state was Daniel Inouye of Hawaii, in 2012. 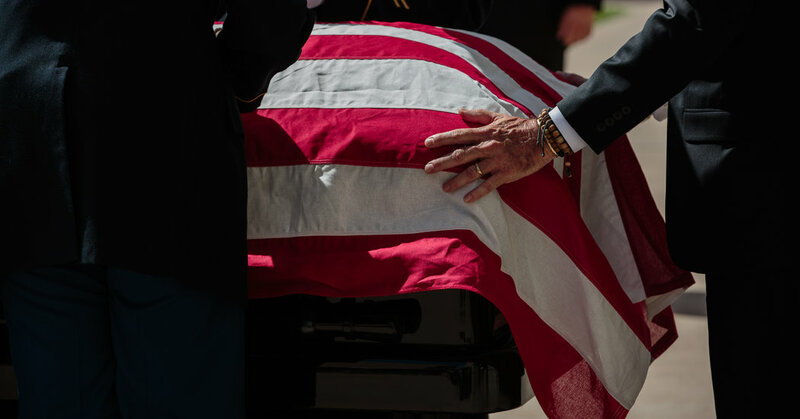 Mr. McCain’s coffin will be displayed atop the catafalque — a wooden platform covered in fabric — built for Abraham Lincoln’s coffin in 1865. Members of the public will be invited into the Capitol beginning at 2 p.m. Friday, after a morning service in which Vice President Mike Pence, Senator Mitch McConnell and Representative Paul D. Ryan are scheduled to speak in a live-streamed service. Ms. Koed, at the Senate Historical Office, estimates that the crowds could be in the thousands and that the lines would start early in the morning. Although some may pause by the coffin, the line generally moves continuously like a procession.